eSchoolView is ranked for the fourth consecutive year on the Inc. 5000 list of fastest growing private companies in the U.S.
We work hand-in-hand with our customers and use their feedback to drive our business model. Our tools ultimately allow them to focus on their number one priority: educating our nation’s students. 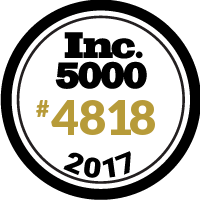 eSchoolView joins an impressive list of the nation’s fastest growing private companies as it lands itself on the Inc. 5000 for the fourth consecutive year. The web developer and host for K-12 schools across the country was founded in 2008. The company is listed at 4818 and reported a three-year growth rate of 46 percent. Eric Schurenberg, president and editor in Chief of Inc. Media, said of the tens of thousands of companies that have applied to the Inc. 5000 only a fraction have made the list more than once. Less than one in 10 of companies recognized on the Inc. 5000 have made the list four times. Much of the growth and that forecasted can be attributed to OneView, a tool eSchoolView created to enhance data integration. OneView helps districts increase internal efficiency and parent engagement by pushing and pulling—with one login—student database information (enrollment details, health records, athletic eligibility) from various student information systems (SIS) such as ProgressBook, PowerSchool, InfiniteCampus and eSchoolPlus. The company hosts websites for more than 1,500 schools and school districts across the country, building sites on a content management system it created specifically for schools. DeKalb County Schools in Georgia and Columbus Public Schools in Ohio are two of the company’s larger clients where a network of smaller districts such as those in New York under the umbrella of the Broome-Tioga Board of Educational Cooperative Services (BOCES) are also part of the mix. Several school districts have been recognized at the state and national levels for websites that have been created by eSchoolView. Most recently, the National School Public Relations Association presented Titusville Area Schools in Pennsylvania with a Golden Achievement Award for its website redesign and rollout plan. The 2017 Inc. 5000 is ranked according to percentage revenue growth when comparing 2013 to 2016. To qualify, companies must have been founded and generating revenue by March 31, 2013; the minimum revenue required for 2013 is $100,000 and $2 million for 2016 with 2016 revenue exceeding 2013 gains. More details about the qualifications and complete results can be found at http://www.inc.com/inc5000.